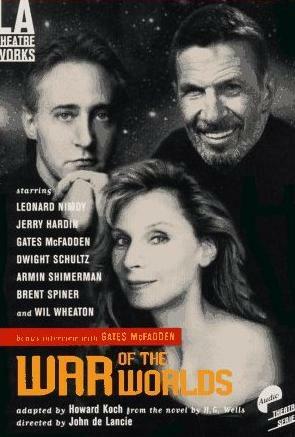 In 1996 Leonard Nimoy and John de Lancie created Alien Voices, Inc., "a company that single-handedly is updating the all-but-lost art form of the radio drama for a twenty-first century audience," Revolution Science Fiction called it in their review of Alien Voices productions (5) The company was born out of the experience of doing War of the Worlds as a radio drama for Simon & Shuster that had already employed the voice talents of many Star Trek actors. Leonard Nimoy, John de Lancie and his wife read a considerable number of stories in preparation for choosing one for production. They were on the lookout for material that would provide the audience with "visual" cues to engage their imagination. After producing two audio only dramas, Jules Verne's Journey to the Center of the Earth and H.G. Well's The Time Machine, both actors decided the time was right to take their productions to the next level. Dreamwatch: Have you found, when casting the parts, that you have been affected by the way people have been known, and tried to cast against type? LN: No - that’s an interesting question, because we’ve given the actors a licence to play characters other than those they would typically play. In some cases, they’re playing characters similar to what they have done before, but in many cases, they’re not, and I think that’s one of the attractions for them. On some of these tapes, some of us are doing more than one voice - those that have that sort of vocal range can change age, or ethnic origin, or whatever - and it’s fun for the actors because they do get to step outside the usual things they are identified with. Dreamwatch: Has that created any sort of negative feedback from the audiences - they’ve seen familiar names, and found it’s not been what they expected? LN: We’re starting out with the classics for as long as we can stay with them. These are much loved pieces of science fiction. They were all written in the late eighteen and early nineteen hundreds; they are sort of the roots of all the great science fiction ideas: interplanetary travel, lost civilisations, time travel, all of that. I don’t know how long we’ll be able to continue with the classics - we may move into something more contemporary in the future, but at least for the time being that was the mandate we gave ourselves. Unfortunately, there were no more TV productions in store for Alien Voices. The SciFi Channel was sold and the new owners did not pic them up. (4) But by then interest had reached a point where the company was recieving request from schools and universities for their scripts to help them mount productions of their own. These requests were met by producing a short tutorial video that shows Leonard Nimoy and John de Lancie working with a group of students, capturing "important lessons and techniques directors will want to employ, including the creation of special effects, sound and original music", "covering the creative process of staging an alien voices drama from conception to production" as stated by Dramatic Publishing, where the video is still available. The blurp on the backside of the video reads: This video was created by Leonard Nimoy and John de Lancie during a staging of a new Alien Voices play created expressly for students, The Wright Brothers' First Flight. This new play was performed for the first time at the California Superintendents Convention in August 1999. Nimoy and de Lancie worked with a group of students whom they had never met before and who had never seen an Alien Voices production. After only 12 hours of rehearsal, the students performed this 15 minute play, earning a standing ovation and critical acclaim. The Alien Voices connection lasted long enough for Signet Classic to ask Leonard Nimoy to write an afterword for their 2003 publication of Jules Verne's A Journey to the Center of the Earth. So many have asked about our AlienVoices productions that we've decide to offer them to you as a direct download for $9.99 each. Our website is growing and in the very near future we will also be offering videos of some of our other titles: Canterville Ghost, Cask of Amontillado, Mark of the Beast, First Men in the Moon and The Lost World. We had a great time making these shows and we hope you enjoy them - be sure to tell us what you think. (1) Actor John De Lancie Discusses Alien Voices and Rebooting Trek. http://blogs.amctv.com/scifi-scanner/2009/08/john-de-lancie-interview.php. Jensen, Mary. Alien Voices Unofficial Website. http://maryjensen.tripod.com/alienvoices/index.html. Here you can find behind the scenes photos from the recording sessions. (2) John de Lancie and Leonard Nimoy. Alien Voices: A Letter to Our Fans! http://johndelancie.tripod.com/helpav.html. (3) Simpson, Paul. Leonard Nimoy on Alien Voices. 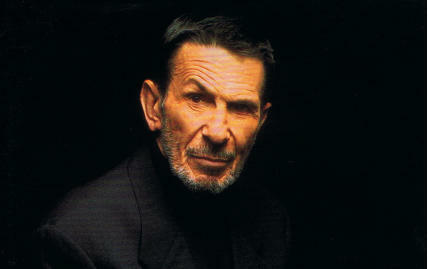 "Dreamwatch", Issue 50, 1998. http://totalscifionline.com/dreamwatch-archive/3279-leonard-nimoy-on-alien-voices. (4) Spelling, Ian. Nimoy spricht "Alien Voices". http://trekzone.de/content/cc/darsteller/tos/leonard-nimoy/leonard-nimoy-spricht-alien-voices.htm. Originally published in Star Trek Monthly, translation by Trekzone. (5) Sturgis, Amy H. Alien Voices (I hear Alien Voices - and they sound a lot like Spock and Q). Revolution Science Fiction, http://www.revolutionsf.com/article.php?id=202. (6) Vogel, Robert. ALIEN VOICES: Zwei Star Trek-Ikonen als Hörspiel-Pioniere. 1999, http://www.robertvogel.net/artikel/alienvoices.html.